The band set the record when they finished off their feat of eight performances on Thursday night in New Orleans. Their journey started a day earlier in Memphis, Tennessee, and they were joined on their trip south through the Mississippi Delta by several other acts and celebrities in celebration of MTV's O Music Awards. 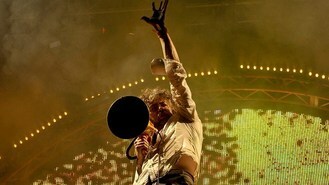 Lips lead singer Wayne Coyne called the record "an absurd joy". Jay-Z previously held the record with seven shows in 24 hours.